Za’tar is a dried herb mix that is popular in Middle Eastern cuisine. Za’tar is usually made by grinding hyssop leaves into a powder, then mixed with other ingredients such as toasted sesame seeds, sumac, and sometimes cumin. Place the oil, vinegar, lemon juice, lemon zest, cumin seeds, Dijon mustard, and black pepper in a blender or mini-chopper. Blend until smooth. Reserve along with the arugula. On a large plate, mix the breadcrumbs, Za’tar, flax or sesame seeds and set aside. On another plate, sprinkle the flour. In a shallow bowl beat the egg and egg whites. Sprinkle one of the cutlets with a little salt and pepper, then dip both sides in the flour, shaking off excess flour. Then dip the cutlet in the egg and then dredge the cutlet in the breadcrumb mixture. Repeat with the remaining cutlets. Coat two large skillets with cooking spray and place over medium-heat. Divide the olive oil and cook turning once or twice until the cutlets are golden brown and the center is no longer pink about 6 to 8 minutes total. 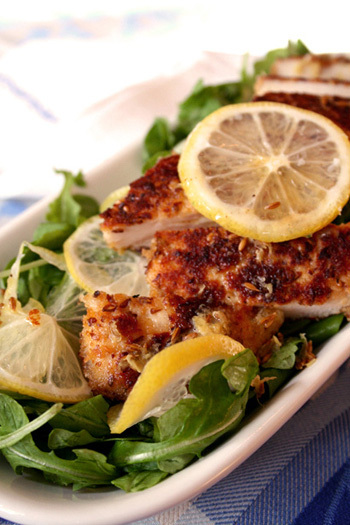 Toss the arugula with the dressing and serve immediately with the cutlets. Nutritional Stats Per Serving (1 cutlet with small salad): 381 calories, 43 g protein, 19g carbohydrates, 14g fat (2 g saturated), 161 mg cholesterol, 3 g fiber, 530 mg sodium. Serve with Asparagus Soup or Orange Sherbet.